Zoroaster’s Telescope is a divinatory system created in the late 1700s by André-Robert Andrea de Nerciat. 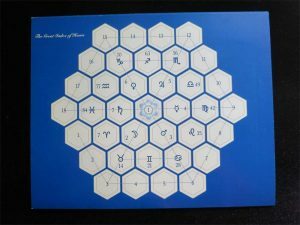 My first encounter with it was through finding images of the Great Mirror and the two Great Indexes while doing research about the magical uses of the hexagon back in 2007 when I self-published my Elemental Hexagons oracle deck. I somehow missed or had some sort of mental block in 2013 when Ouroboros Press of Seattle did a limited edition English translation of Zoroaster’s Telescope. When the existence of this text finally came to my attention in early 2016, I immediately bought myself copy for my birthday. It was by referring to this text that I created all of the artwork used in this physical reproduction, which is now available through a print-on-demand process. 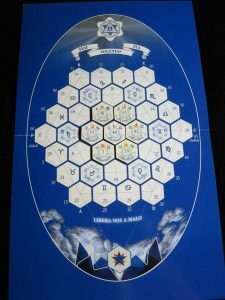 At its core, the Zoroaster’s Telescope system is a collection of 112 hexagonal tokens referred to as “the Urn.” Two of these tokens represent two principles: Sisamoro/Ormuzd – infinitely good; and Senamira/Ahriman – malicious evil. Two more tokens are for the intelligences Sallak, a guardian Angel, and Sokak, an evil Genius. For obscure esoteric reasons I will get into further down the article, there are nine tokens for the various Intelligences associated with the Sun, the Moon and the five other classical Planets. Lastly, a token for the numerals 1 through 99 brings the total to 112. Each of the numeral tiles includes a Zodiac sign, a Planetary sign, and the name of one of the 28 angels who rule over the 28 Mansions of the Moon. A subset of tokens, never more than 37 in one reading, are drawn from the Urn and arranged into the form of the Great Mirror. 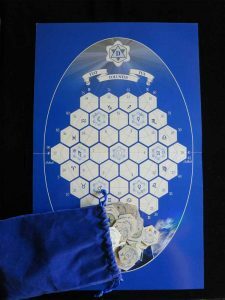 The tokens are then interpreted using a combination of factors including numerology, astrology, planetary associations, angelic associations and chronological factors built into the Great Mirror’s structure. The Great Index, like the Great Mirror, is a diagram made up of 37 small hexagons tiled into a singular larger hexagon. Nine of the 37 smaller hexagons represent the nine Planetary Intelligences. The remaining 28 small hexagons represent the Angels who rule over the 28 Mansions of the Moon. This diagram is a map on which the character of any given Angel can be understood by observing the proximity to the various Planetary Intelligences to the Angel, and by noting which of the Fixed Stars is behind the Angel. The nine Intelligences correspond to the planets. Saturn, Jupiter, Mars, Venus and Mercury each have a singular associated Intelligence, while the Sun and Moon, being much greater in scope than individual planets, each have two Intelligences. Genhelia and Psychelia are both associated with the Sun, with the former corresponding to the material and the latter to the spiritual. The Moon also has two Intelligences; the material Intelligence is known as Seleno, while the spiritual Intelligence is Psychomene. The Intelligence of the planet Venus is Erosia. That of the planet Mercury is Panurgio. Saturn’s Intelligence is Lethophoro. The Intelligence of the planet Jupiter is called Aglæ. Adamasto is the Intelligence of the planet Mars. Three of the 28 Angels were immediately familiar to me and will be familiar to most: Raphael, Michael and Gabriel. Most are still strangers. I am no expert in this system by far. Even the Ouroboros Press text reveals little about the individual Angels and much is left as an exercise to the reader. Book II Chapter XXXIII of Agrippa will prove invaluable in understanding the natures of the 28 fixed stars behind each Angel. Most divinatory systems are used to read for answers to immediate questions. Zoroaster’s Telescope can of course be used in this way. However, much of what is built into the structures of the Great Mirror and the Great Index of Hours has to do with reading over longer time spans. The outer ring of the Great Mirror consists of 18 hexagons. Around the outside edge, these 18 hexagons are numbered in increments of five, representing a healthy lifespan from 5 to 90 years old. On the Great Index of Hours, the Zodiacal Belt represents an 84 year period divided into twelve segments of seven years each. The Zodiacal Belt of the Great Mirror can be used as a clock face to read each hour of a day or as a calendar to review an entire year one month at a time. The 18 year cycle around the outside of the Great Index of Hours can be used to read for the life of a child from birth to maturity. Zoroaster’s Telescope reading in progress. The Zoroaster’s Telescope presentation will be on Sunday, February 19th, 2017 at 1:30 PM in the Circle of Cerridwen Hospitality Suite, Room 966. This website is the virtual home of the covens of the Open Source Alexandrian Tradition, the Witches' Order of the Golden Dawn, and our greater spiritual community. We are intentionally radically inclusive and welcome all persons of any race, color, age, ancestry, sexual or relationship orientation, body size, gender, religion, or any other difference. We invite you to share your thoughts with us and be a part of our community! st4r.org by The Open Source Alexandrian Tradition is licensed under a Creative Commons Attribution-NonCommercial-ShareAlike 4.0 International License. Based on a work at http://st4r.org. Permissions beyond the scope of this license may be available at http://st4r.org/main/contact/.